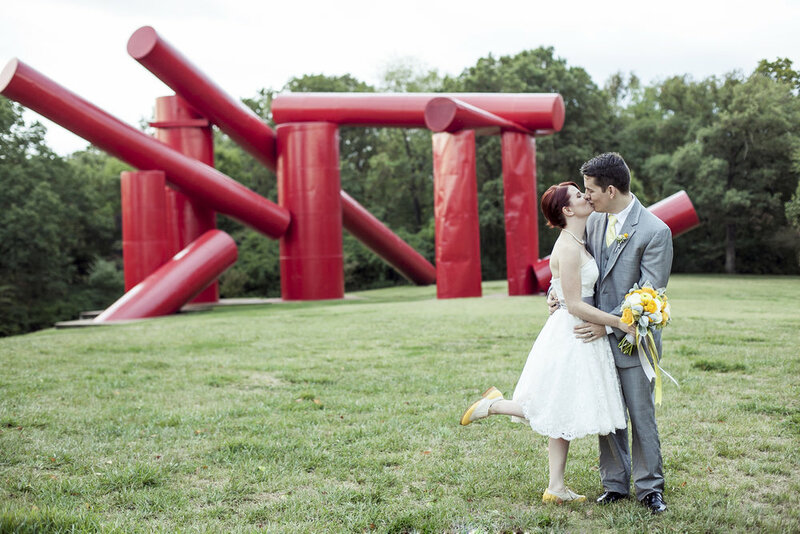 Laumeier offers unique indoor and outdoor rental spaces set among the Park’s 105 acres and 60 large-scale sculptures, for anywhere from 50–500 guests! Laumeier is perfect for wedding ceremonies, receptions, showers, rehearsal dinners, corporate meetings and events, family reunions, picnics and similar affairs. Photo opportunities are endless! Outdoor spaces include the romantic Leaf Pavilion or Heartland Garden, the rustic Moss Shelter, the sculpture-studded Estate House Lawn & Terrace and the Way Field. Indoor options include the historic 1917 Estate House, featuring the Fireplace Room, Tile Room and Outdoor Terrace, and the contemporary Aronson Fine Arts Center Gallery. Laumeier Membership required for event rentals. Visit Laumeier Sculpture Park's profile on Pinterest. Contact Scott Layne, Events Manager, at 314.615.5276 or slayne@laumeier.org for event rental inquiries. Site visits are by appointment only. Contact Laumeier at 314.615.5271 or info@laumeier.org for picnic rental inquiries only. Interested in a private clay workshop with family, friends or colleagues? Private parties are located in the Kranzberg Education Lab's Staenberg Family Foundation Clay Lab. Contact the Education Department at 314.615.5268 or education@laumeier.org for more information and pricing.